Ready-Stick™ Epoxy Putties are hand-kneadable, will patch holes, repair cracks, and mend most anything that is broken. Excellent for rebuilding and fabricating parts. Ready-Stick Epoxy Putty-General purpose for metal, wood, glass, masonry, ceramics, concrete, fiberglass and many plastics. Applications: Plumbing and electrical repair, construction equipment, auto/truck repair, home/shop repair, iron pipes, concrete tools, oil and water tanks, tools, stripped threads, sink and pipe joints, gas tanks and radiators, molds, patterns, castings, and duct work. 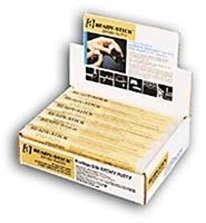 Ready-Stick Epoxy Putties are individually packaged in re-sealable plastic tubes.